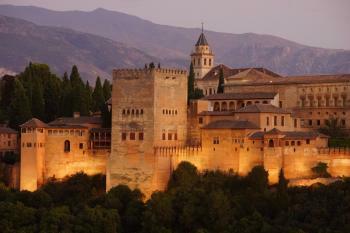 The Alhambra, Generalife and Albayzín in Granada are exceptional reminders of Moorish Spain. In the 8th century the Islamic Moors of Northern Africa had conquered most of the Iberian Peninsula. Several centuries of struggle between Moors and Christians (striving for the Reconquista) followed. The Nasrid dynasty was the last Muslim dynasty in Spain, before all were finally expelled in 1492. The Alhambra ("the red fortress") is a palace and fortress complex built by the Moorish monarchs of Granada. Its existence was first mentioned in the 9th century. During the reign of the Nasrid Dynasty, the Alhambra was transformed into a palatine city complete with an irrigation system for the lush and beautiful gardens of the Generalife located outside the fortress. The Palacio de Generalife, to the east of the Alhambra, was the summer palace and country estate. It was built during the early 14th century by the Nasrid sultans. The Albayzin is an old residential neighborhood in Granada, opposite from the Alhambra. It has both Moorish and Andalusian influences. The Albayzin was a later (1994) addition to this World Heritage Site. This must be one of the most popular WHS in Europe. Even on an early Monday morning in March there were long lines of visitors when I arrived at 8.30. I had to queue with about 300 other people that had been so foolish not to pre-book a ticket. Announcements told us that only 150 tickets were left for the morning, and 750 for the afternoon. When I finally, at 10.10, got my ticket it was for an afternoon visit and with a 16.00-16.30 time-slot to enter the Palaces of the Nazarenes. In hindsight, I was quite happy starting my visit in the afternoon. The sun had warmed up the earth and I could walk around in a short-sleeve shirt and sit outside. The Alhambra complex (castle, palaces) and the Generalife occupy a large area. I had been here before (1991), but I do not remember a thing about that visit. 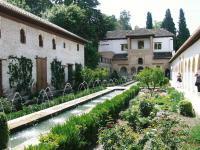 This time I started my tour at the gardens of the Generalife, with its Mediterranean plants and trees and pools. At the entrance gates for the Nazarene Palaces we had to queue again, and I found myself just behind the same Austrian couple as this morning when we were buying our tickets. Getting inside is pretty organized though: they let in small groups about every five minutes, so it doesn't feel too crowded. In about every room there are elaborate carvings and mosaics to be admired. Unfortunately, the Court of the Lions is under construction at the moment and its celebrated Fountain of Lions has been taken away for restoration. After the palaces I strolled around the Alhambra complex once more, visiting the Alcazaba, enjoying the sun and finally walking back to Granada's city center for dinner in the Albayzin quarter. I visited this WHS in September 2017. I knew before going that this site was very popular and that it is supposedly one of Europe's top sites. However, the information available online is quite confusing and everything seems far more complicated than it actually is to visit. First of course you need to book your ticket online to visit the Nasrid Palace and Gardens (it really is a must and a highlight). There are so many different possibilities and so many different online travel agencies acting as if they were the official vendors that the whole booking process can be quite daunting at first. Moreover, the tickets are available only from three months in advance. The official site is the one linked to Ticketmaster and you simply choose the date of your visit, and whether you would like to visit the Nasrid palace in the morning or in the afternoon. The receipt is not the actual ticket (which is a tad cumbersome) and you have to enter the same credit card used to book the ticket in a specific machine (which is always supervised, so nothing to worry about) at the Coral de Carbon, the Alhambra ticket office, ticketmaster cashpoints near the Alhambra or at specific Caixa cashpoints. I opted for the Alhambra General day ticket and an afternoon visit of the Nasrid palace and gardens (which is best for courtyard photography). This ticket includes visits to the Alcazaba, the Generalife palace and gardens and the Partal gardens. 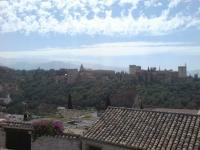 Early in the morning I opted to walk to Barrio Sacromonte for splendid panoramic views of the Alhambra. The famous panoramic viewpoint Mirador de San Nicolas is only worthwhile in the afternoon (for photography). The whitewashed Albaicin district is worth getting lost in. There is a UNESCO WHS marker next to the Vega river and 2 UNESCO WHS inscription plaques: one near the Alhambra ticket office and another near Alhambra's Puerta del Vino. Although the Alhambra is a magnet for tourist groups, the gardens can easily take countless groups without feeling to overcrowded. If you want to go on a splurge you can also opt for a stay at the Parador San Francisco which is inside the Alhambra! The Alcazaba is worth visiting in the morning for the magnificent views of the Albaicin and Sacromonte districts from Torre del Homenaje, Torre del Cubo and Torre de las Armas. The former tower views are the best as they are the closest to the Nasrid Palace. The Partal balcony plasterwork is worth taking in as well as the 14th century steam baths (hammas) of the Alhambra. The incredible patio of the Renaissance Palacio de Carlos V was a pleasant surprise among the exquisite Moorish architecture and the Alhambra museum inside is worth visiting. At around 13:20 I decided to queue for the 14:00 entrance to the Nasrid Palace and Gardens. This meant that I was the first one to enter at the alotted time slot and I headed straight to the Patio de los Arrayanes and the Patio de los Leones to view them when they were least crowded. I could go back and forth from one building to the other for hours on end once inside and take in the incredible ceramic tiles, intricate plasterwork and muqarnas. It really is like a return ticket to Morocco. Another hightlight was the view from the Mirador de Lindaraja. In the late afternoon I headed towards the Mirador de San Nicolas which was full of tourists and locals. A sweet old lady dressed in traditional clothes was selling flamenco castanets. The sunset view from here is breathtaking to say the least. However, behind the hundreds of people who gathered at the square, I caught site of the recently painted St Nicholas Bell Tower next to scaffolding covering the rest of the church. I peeked inside and a friendly local greeted me and asked whether I would like to see sunset from the bell tower for a small donation for the church restoration project which should be ready by 2018. I closed the gate behind me and after climbing just a few stairs, I had an even more spectacular view all to myself: the Generalife, the Alhambra with the Sierra Nevada in the background, Granada with the Albaicin and Sacromonte districts, the Vega and the Valley of Valparaiso - all in one view (photo). Granada didn't disappoint and for me it surely deserves to be among the top 200 WHS on the list. The view to the Alhambra from the Mirador de San Nicolas provides an impression of the size of the palace complex, the massive walls and towers appear austere and powerful, nothing indicates that the interior houses a gem of Moorish architecture. And even when you stand in front of the entrance gate of the Nasrid Palaces - the heart of the Alhambra - you see only an inconspicuous façade. In contrast to European palaces, a sumptuous exterior is not characteristic for Moorish architecture. But that changes fundamentally as soon as you enter the interior: abundant wall decorations, inner courtyards with fountains and water basins, coloured tiles everywhere, elegant columns, filigree stucco decorations. Unfortunately, large parts of the Nasrid Palaces were destroyed after the Reconquista, e.g. to build the Palace of Charles V.
We visited the Alhambra in September 2016 and I agree with other reviewers that booking in advance is highly recommended. You can print your pre-booked tickets at one of the ticket machines without queuing. In summer, you have to choose between morning and afternoon visit and you have to select a time slot for the Nasrid Palaces. However, it is hardly possible to avoid the crowds, there are tourists all year round, probably less in the winter, but this is not the best time for a visit, at least for the Generalife garden, beside the Nasrid Palaces the second highlight at the Alhambra. Alhambra and Generalife are well described elsewhere, so just a few remarks on the Albayzín, the oldest quarter in Granada. The above mentioned Mirador de San Nicolas is a must (the photo shows the view to a part of the Nasrid Palaces). I recommend a visit in the evening at sunset, and though you have to share the beautiful view with hundreds of tourists, it is an unforgettable experience. I liked the narrow streets and white-painted houses of the Albayzín. One gets lost inevitably, but that does not matter, sooner or later you will find the way downhill to the Carrera del Darro or the Plaza Nueva. There are several buildings that can be visited, the tourist information offers a combined ticket and a map with the locations. We visited three sites: the Banuelo (larger and more interesting than the baths of the Alhambra) and two palaces, the Casas del Chapiz with a beautiful garden and nice views to the Alhambra and the Palacio de Dar al-Horra. Unusual for Andalusia, these sites are opened all day without a siesta break. For the evening, I recommend the restaurants and bars at the Plaza Aliatar or Plaza Larga, which are also popular with locals, or along the Carrera del Darro. Our favourite tapas bar was La Gran Taberna at Plaza Nueva, a traditional tapas bar open until late at night and perfect for a last drink. I think that everything is said about this site. You should definitely book tickets to Alhambra in advance. When I visited this site in June it was +36 Celsius and people waiting in a long queue. Not nice. I took my booked tickets easily from ticket machines. Area was beautiful and views to the city were amazing. Sad thing was that the Court of the Lions was still in construction. Good thing was that there were many drinking fountains in the area. And the area of Albayzin is definetely worth of visit. Having visited the Alhambra and the Genaralife previously (50 years earlier), this time I spent more time in the Albayzin. I took one of the little buses (#31 & 34) that wind through the narrow streets from the Plaza Nuevo take you to delightful little squares and streets beside the Darro river. Stopped in the Plaza San Nicolas for al freso lunch while listeneng to a live concert and overlooking the Alhambra and the Sierra Nevada. Visiting in early June I was fortunate to get access to the Palacios Nazarias within two hours of buying my Alhambra ticket at 08.30, so had the rest of the day to wander through the gardens afterwards. This is my fourth visit to the Alhambra complex and it remains magnificent and timeless. The gardens in combination with the chambers and courts invite spiritual awareness. The Albaycin is a pleasant reminder of the Moors and the views from there of the Alhambra and the Sierra Nevada behind are stunning. Of historical significance included Ferdinand and Isabel's defeat of the Moorish King , Boabdil , completing a big chapter in history. Gorgeous, absolutely fantastic and I recommend everyone should visit at least once in their life. The easiest way to get there is to catch the shuttle bus from Plaza Nueva up the hill - then walk back down at the end of the day. Can't wait to go back again. Absolutely breath taking, the building itself is dreamlike and condusive to fantasies and daydreams. It would be a fantastic place to go with a loved one because of its romantic nature. The garden is amazing, especially when I went as most the flowers were in bloom (It was about June if I recall correctly). Nearby, you there are shops and artist studios where you can learn how the beautiful inlays that are typical of Moorish architecture are made, making you appreciate the beauty all the more. Site consists from there different places. Albayzin is a white painted jewish quarter on a steep hill. I really enjoyed walking through those narrow streets and at the end to enjoy the best view on Alhambra from San Nicolas. 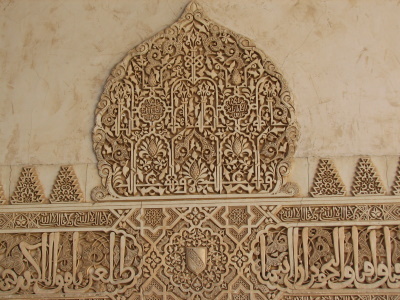 Alhambra itself is complex of military (Alcazaba) and secular palaces. Most important for visit is Nasrid Palaces with its Mudejar architecture. It has very similar decorations as Alcazar in Seville but somehow nicer. To get inside is quite a problem as tickets are very difficult to get in summer season. Please book with advance via http://www.servicaixa.com or you will be frustrated. The town of Granada I didn't like very much. It was just an ordinary Andalusian town. I recommend to visit Capilla Real where spanish rulers Isabela and Ferdinand are buried. The Alhambra of Granada is a true work of art and reminiscent of a time in history few people know about - when Arabs ruled much of Europe. I have been there twice, and while my first visit in 1996 was just a quick day trip from the Costa del Sol, in 2013 I made sure to invest some time and effort to really see it all. The main palace is a breathtakingly beautiful place, and the Generalife Gardens and the Alcazaba Fortress are very impressive as well. You can easily spend a whole day in the complex, but after a while it will get exhausting. As mentioned elsewhere, advance reservations are highly recommended. The rest of Granada is quite interesting as well, including the Albayzín quarter with the Arab baths and the stunning San Nicol's viewpoint overlooking the Alhambra, and the Sacromonte district with its cave dwellings. The city centre features a very large Renaissance cathedral and the adjoining chapel containing the tombs of King Ferdinand of Aragon and Queen Isabel of Castile, whose marriage in 1469 paved the way for the ouster of the Arabs from Europe, a united Spain, and the conquest of the New World. Pre-book your Alhambra tickets here! Chahar Bagh Gardens: "As a garden (Bagh), the more characteristic one is the Court of the Lions, where the water basin sustained by twelve sculptures of lion sends up a jet. It is encircled with cloisters, from which two pavilions project to the patio, and the channels flow out from the cardinal point rooms to come together to the central fountain, so as to divide the rectangular garden into four-quarters. That is exactly the quadripartite garden (Chahar Bagh) constituting the basic principle of Islamic gardens." Baths: Wiki - "Granada's public baths, like El Ba?uelo or the Alhambra Baths, and the complex of Arab public fountains and wells (aljibes), are unique in Europe." Leo Africanus: Born in the city (presumably in the Albaicin). The terms of the Treaty following the Christian conquest allowed the city's Muslim inhabitants to continue their faith. Leo's family left for Fez before the persecutions commenced in 1499. Built in the 14th century: Although Alhambra was built over several centuries it is best known for its 14th century Moorish style. Generalife was built during the reign of Muhammad III (1302-1309) and redecorated shortly after by Abu I-Walid Isma'il (1313-1324). 461 Community Members have visited.